Moon 23° Capricorn 22' 54"
“What’s in a name? That which we call a rose, by any other name would smell as sweet,” quotes Juliet to Romeo in Shakespeare’s classic. Yet, in art, sometimes the name is the only indicator to the art enthusiast about the painter’s intention. Salvador Dali was a strange man, is quite the understatement, and so we have much to meditate on in his “Meditative Rose,” rendered in 1958. I can safely say that artists are strange people with sweet and not so sweet symbolism. An imaginative youth, like many artists I fell in love with Surrealism for its ambiguous and oddly direct treatment of reality and existentialism. I remember my conservative grandparents being fascinated and appalled by the man as much as his artwork. 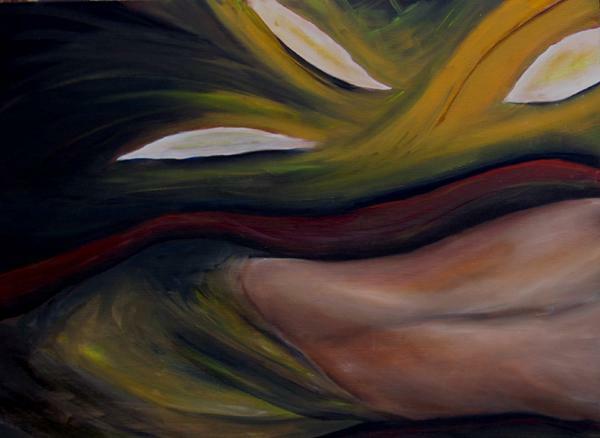 This perspective lives on among most individuals today, as the artist’s work ever evokes paradox, and in turn duality. I found a beautiful truth in Dali’s “Meditative Rose.” Daily experience is subject to five sensory filters–smell, sound, touch, taste, and feeling, a delirium of interpretation. Dali turns that on the head. The rose defies gravity, fully bloomed over the desert landscape, so common to the artist’s work. It even has its own subtle white aura, as the it floats over the ground and the couple contemplating the horizon. A single dew drop rests on the lower petal. Even over the dreary landscape, the rose is suspended sun-like. While the rose projects light like the sun, it also seems reflective, with a touch of cloud white on a top right petal. The top half of the painting is made of primary colors: red, yellow, and blue, reflected over the landscape. Modern artists, who also dabbled in the science of color, called blue the most spiritual color. The rose is reminiscent of a a perfectly visually balanced mandala, used for meditative, ritual, and artistic practices. Psychologist Carl Jung attempted his hand at painting a Golden Flower mandala. The two works are striking when compared. While we could certainly attempt to meditate to this painting, many theorize that the rose isn’t just a spiritual symbol. In fact is is a celebration of love, perhaps of Dali and his wife Gala. 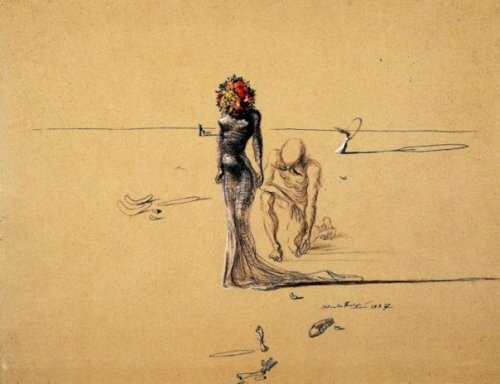 The use of figures in pairs on desert landscapes isn’t anything new in Dali’s works. Reference “Archaeological Reminiscence of Millet’s Angelus,” painted in 1935. The use of figures in space in such a way is characteristic of the painter. In his 1937 “Untitled,” or Woman with Head of Flowers, a strange male figure with a Daliesque, twisty mustache bows before the woman. I don’t have a twisty, villainous mustache, but I did let out a rather sinister laugh when I discovered how deeply entrenched the artist’s influence was in my own work. I first saw this piece as a poster when I was a little girl, and it was my true introduction to Dali. The truth I discovered in the “Meditative Rose” is another form of timelessness and a beauty. The bright red of the hue makes it hard to stare away. A nice summary of the piece may be the the cliché saying, “Beauty is in the eye of the beholder.” In my own work, I find that I explore a widely-defined type of universal symbolism, emotion, and philosophy, juxtaposed against landscape. This is true especially in relation of the body to nature. In returning to look at this piece again since my childhood, I discover striking similarities between our use of symbolism as pictoral elements. The following piece is part of my first solo show. This artwork, entitled “Amongst the Lilies” has an abstract torso (which is almost a landscape) and a series of floating lilies over the horizon. The piece is a exploration of the Dark Night of the Soul, where the individual follows a journey to becoming closer to spiritual wholeness or a god. The poet Yeats compares the journey to becoming one with a lover after a series of doubts. I also approach the painting as this metaphor. Eventually, the draped individual is supposed to reach that “wholeness,” which in a later painting is simply the fading white lilies on black like wisps of smoke. Regardless of choice of symbolism or use of pictoral images, I resonate with Dali and his famous floating rose. At the most primal level, it represents an outlived sense of beauty and joy that is omnipresent. Is there a particular artist that you admire? Article by the author originally published 01.07.2011. Next Post Art in a Nutshell: What is Primitivism?